Created by Sherrill Roland in 2016, the Jumpsuit Project continues to ignite conversations around issues related to incarceration. 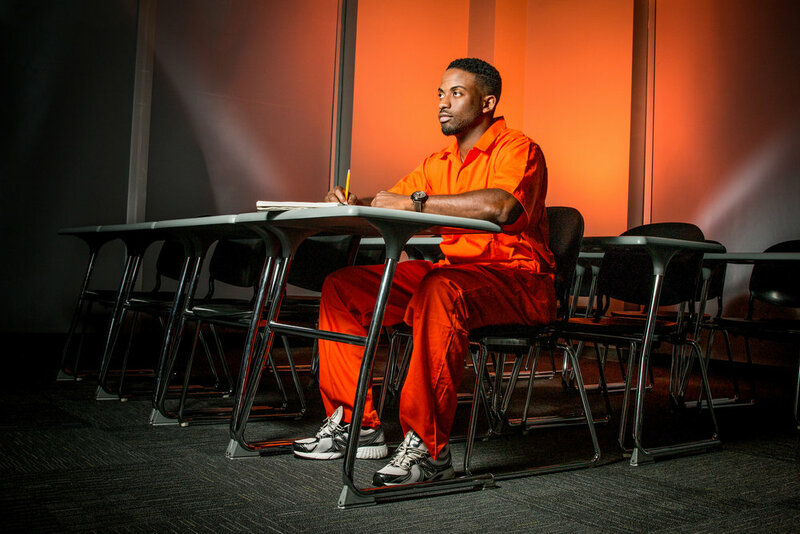 His performances challenge those who encounter the orange jumpsuit by encouraging them to address their own prejudices towards those incarcerated. The Jumpsuit Project challenges ideas around mass incarceration and works to generate a safe space to process, question and share. Prior to his own incarceration, Roland maintained a very general understanding about prisons and the justice system in our country – founded heavily in the media’s own depiction of imprisonment. Roland was unaware of the growing numbers of individuals incarcerated in the United States (both those proven guilty and wrongfully accused). Roland was naïve about the deep-seated social and political issues surrounding the culture of the prison system. His experience opened his eyes to the great impact incarceration has on those individuals behind bars, as well as their family members and friends. The Jumpsuit Project provides a window into the lives that have been impacted by incarceration. Through sharing his own story, and creating a space for others to share, light is being shed on the enormous darkness incarceration brings.